It has been warm in Seattle – just like most of the country – and I planned to share a peach soft serve recipe with you this week to help beat the heat. But, as often happens, I got sidetracked onto something totally different. I’ll work up the soft serve recipe soon – peaches are in season and very juicy right now, so it’s only a matter of time. The source of my distraction was, of course, Whole Foods Market. You see, I picked up a box of Flackers on a whim on Thursday. I violated the cardinal rule of grocery shopping – don’t go to the store hungry – because I was there to pick up some lunch from the hot bar, so being hungry was part of it. Looking for something to go with my salad, I stumbled into the snack aisle and ended up with both Flackers and chickpea snacks from Biena. They were both really good, and honestly, you could make both types of snacks at home fairly easily (which is a good test to if something is super processed or not, by the way). 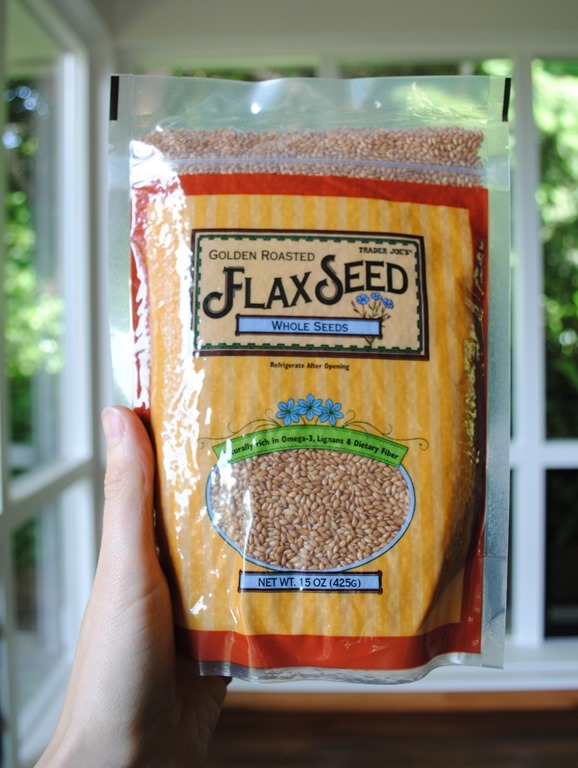 For years, I had a flax seed sensitivity. 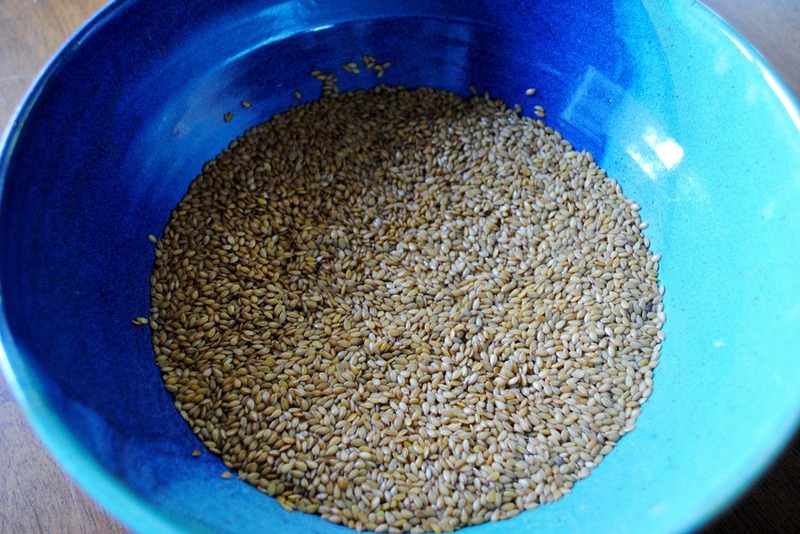 If I ate anything with a hint of flax in it, the lymph nodes in my neck would swell up within a day or so. However, a few months ago, when I had food sensitivity testing done, Emily told me that I wasn’t showing sensitive to flax in any of its forms. And wouldn’t you know it, she was right! I have been happily consuming flax ever since. By the way, for those curious, I have successfully added back in most things from my sensitivity tests except much dairy – that one continues to get me every time. 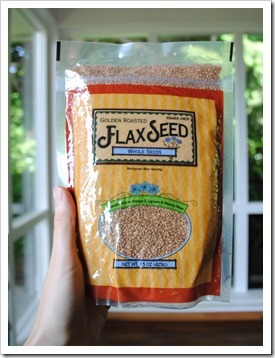 Flax seed is really fantastic in a lot of ways – it is a good source of protein, fiber, and Omega-3 fatty acids. Here is a great summary of all of its benefits from the maker of Flackers. One of the biggest ones is that they keep you full. 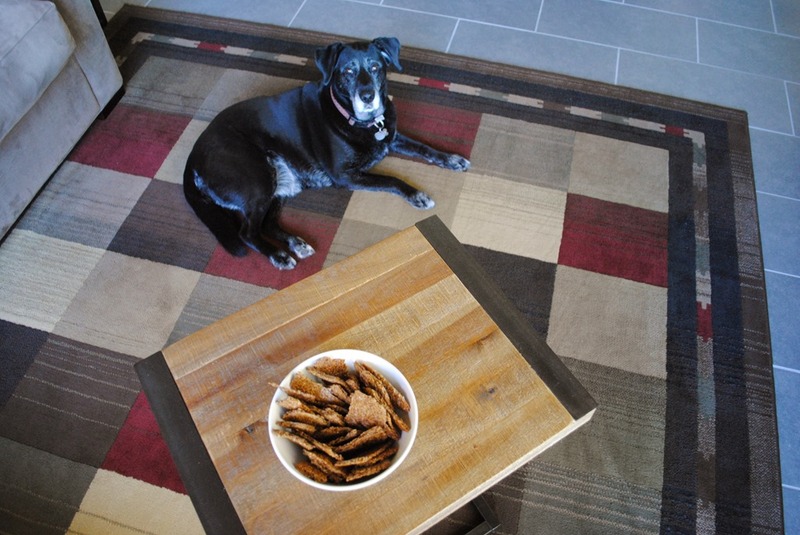 Just a few flax crackers with a meal and you will be surprised at just how full you are. 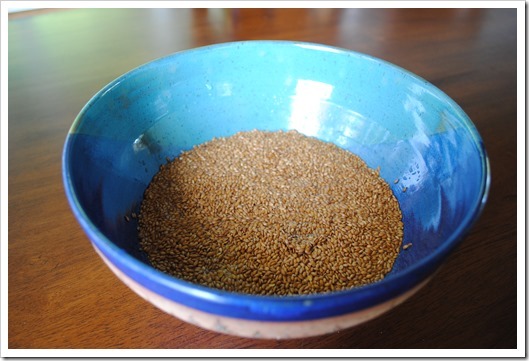 Keep in mind that flax is definitely one of those “in moderation” foods – too much can cause GI distress. You’ve been warned! 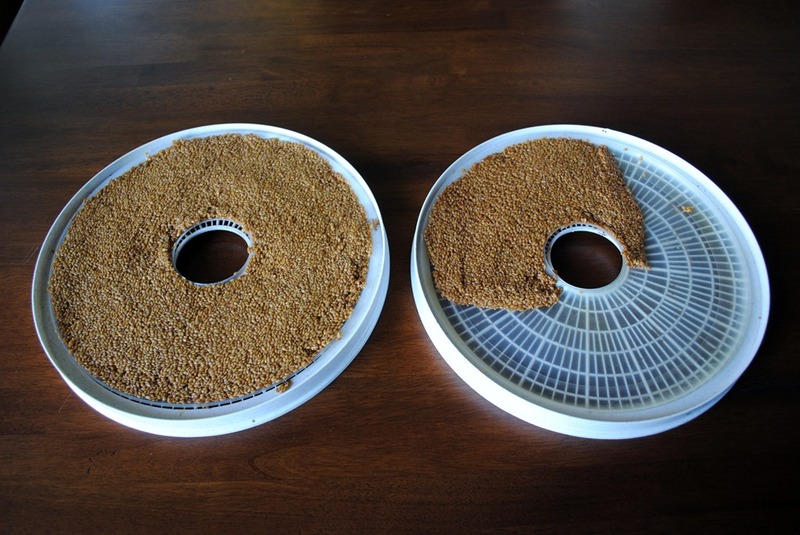 Since I am more of a DIY-type, and will take any excuse to use the dehydrator, I thought it would be fun to make my own flax seed crackers. This couldn’t be easier, and of course, it is significantly cheaper to make your own crackers than buy them already made. 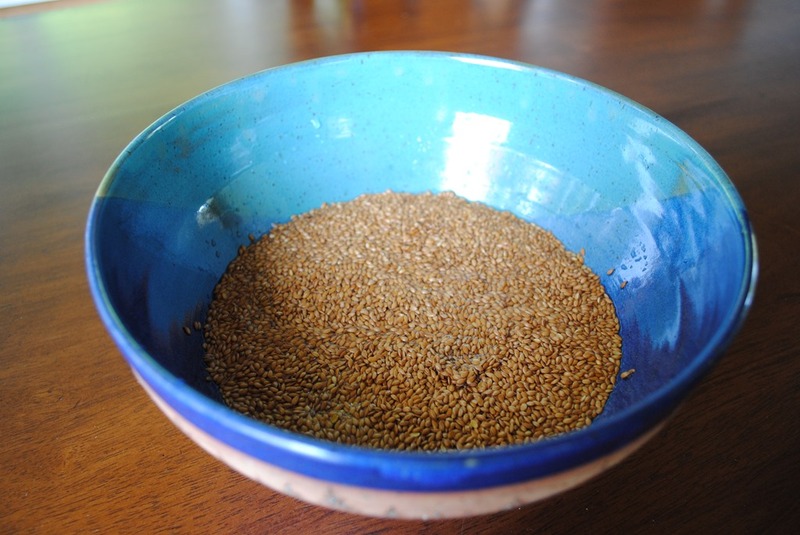 I bought a bag of whole golden flax seed at Trader Joe’s for $2.99, and after making this recipe, had about 1/3 of the bag left. 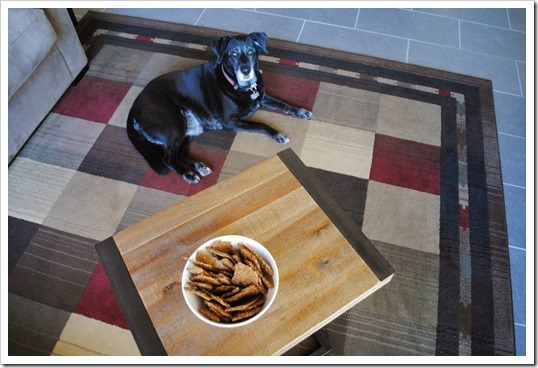 Since the ingredients – as you’ll soon see – are simply flax, water, and whatever spices you want, this makes the total price for this recipe a whopping $2.00 (give or take a few pennies), which creates about 36 crackers sized about 2”x2”. A box of flax seed crackers containing six servings of six crackers each is about $5.29 at my Whole Foods location. So, DIYing is definitely worth it! Plus, you can add whatever flavorings you like, you don’t have to just go with what is available on the shelf. Before we begin, since I know it will come up, this is the dehydrator I use. It is nothing fancy at all, and it does the trick just fine. 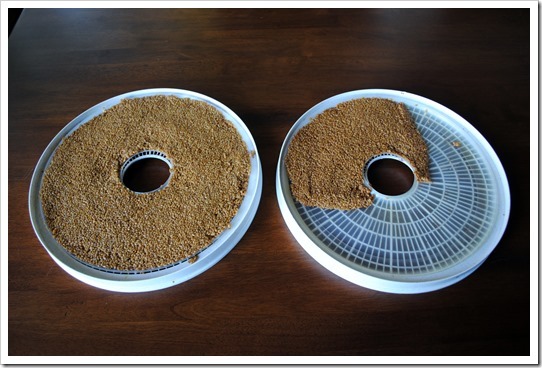 If you’re thinking of getting into dehydrating, it’s a low cost of entry for a solid workhorse. 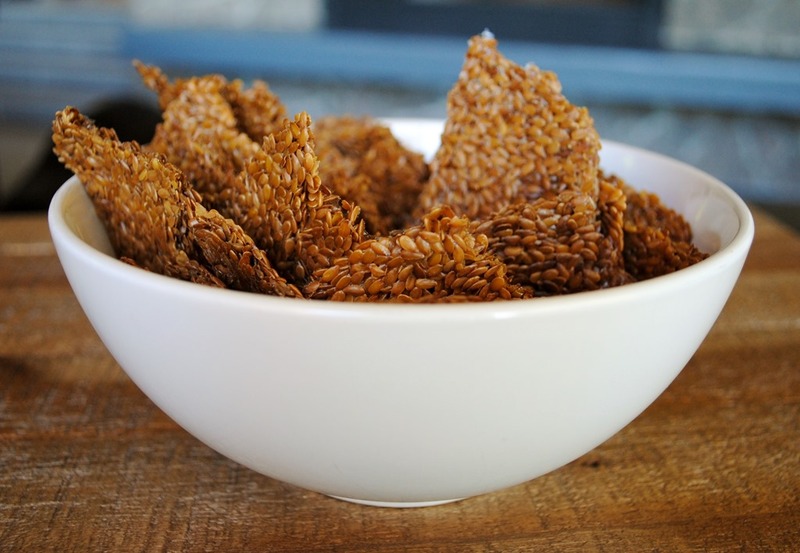 If you want to make flax crackers in your oven, this is totally possible as well! 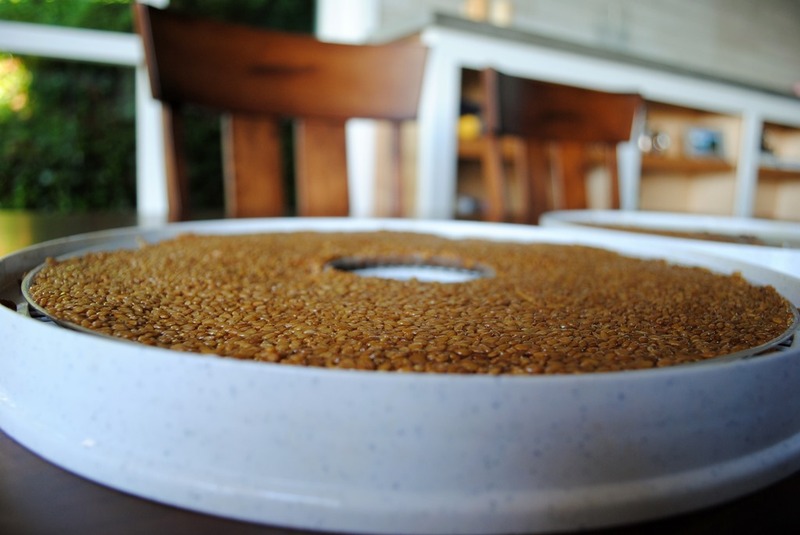 I don’t have an oven right now (good ol’ remodel), so I can’t test this out for you, but here is an article that uses an oven and ground flax seed to make crackers (and the writer is a photographer so her photos are stunning). 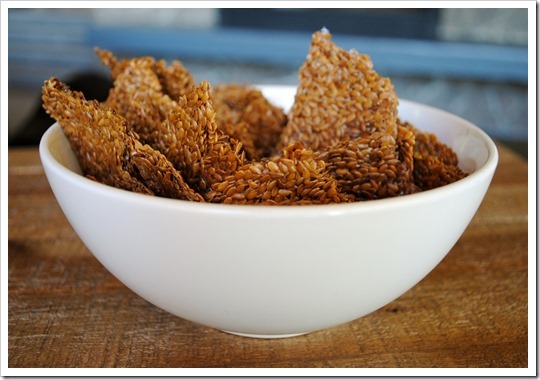 With very little effort, you can make a crispy, gluten-free, high fiber, and tasty cracker! The general ratio for these crackers is 1:1 whole flax seed to water. You can make this in any proportion you want, but I went with 2 cups of flax seed and 2 cups of water. 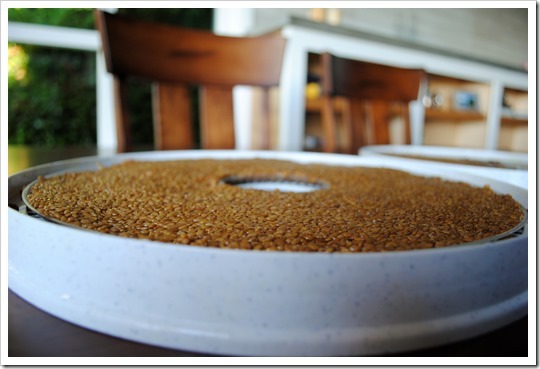 Next time, I will probably do 3:3, since that would use the entire bag of seeds from Trader Joe’s and fill up both of my jelly roll dehydrator sheets. 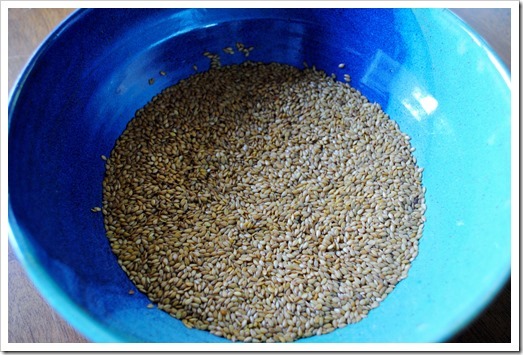 Add 2 cups of water and 2 cups of whole flax seed to a bowl, cover, and soak for at least 1.5 hours, and up to 4 hours. After you have soaked the seeds, they will be sort of a gel-like viscous texture, which is hard to show in photographs, so you’ll have to trust me! This picture was taken exactly 4 hours after the first one, and the seeds have gelled together, but are still workable with a spatula. Mix in any spices you want at a ratio of about 1-2 teaspoons of dried spice to 1 cup mixture. You can really go with what you like here – or nothing at all. I went with just a couple of pinches of sea salt for most of the crackers, and, added a little bit of cinnamon and coconut sugar to the small balance I had after I filled up the first jelly roll tray. Spread into a jelly roll tray or Teflex sheet in an even layer with a spatula. When making crackers, I use the height of the jelly roll tray to dictate how thick to make the crackers. The 2:2 ratio gave me one totally full tray, and one partially full tray. This will vary based on your dehydrator. If you like very regularly-shaped crackers, you can pre-score them so they will break easily when dry. I don’t care so much about regularity, so I didn’t do this step and just broke them up by hand. Dehydrate for 12-15 hours, until desired crispness is reached, and break apart into crackers. I like to put things in to dry before bed, so they are done in the morning. You may have to flip them over and dry the opposite side if they still seem wet on the backside when you’re done with the top side. Just flip them over, and dry another 2-3 hours on the backside. My batch started drying at 7 p.m., and, when I got up at 7 a.m., they needed 2 more hours on the backside. If you look closely in the above photo, you’ll see a very small portion of my sweet Pipa dog hovering around in the top left. Oops, here she is again! Hello, I am so excited to have found your site. I have had my Ninja Kitchen System for about 3 weeks and I really like it…thanks to your site. Lots of great tips that have been quite helpful. I have a question. I am trying to eat mostly raw foods – fruits, veggies, nuts, seeds, and occasionally eating cooked items such as beans, rice, etc. I would like to stay as vegetarian as possible, so here is my question…what does your diet look like in a day? I love the green smoothies, fresh fruits and veggies, but I just don’t feel like I am getting enough proteins and healthy fats. I know you do about the same type diet and just wanted to know what your day looks like regarding foods. Thank you for all you are doing. Keep up the great work. You know, I have had several folks ask this question recently, so I need to do a “day in the life” food post soon. I’ll work on that in the coming days. But, what you have described is generally how I eat. Are you on MyFitnessPal? If so, I can share my journal with you (I think!). First breakfast – small banana and a DIY lara bar before I run or swim. If no morning workout, I don’t have this! I try to put protein and fat into everything and minimize carbs, though I don’t restrict any fruits or veggies. I am a veggieholic! Proteins I like are lentils, beans, tempeh, sometimes eggs, sometimes wild-caught salmon, nuts, seeds, and generally one serving of protein powder a day. I take a B-Complex, Fish Oil with Vitamin D in it, and a Probiotic, but otherwise don’t supplement. B-12 is one of those things that vegetarians can’t get through food, so I don’t risk it. Hi there. 🙂 Can I ask what temperature setting you used on your dehydrator to make these? My dehydrator doesn’t have adjustable temperature settings, unfortunately. I’d say if you can choose something like 115 or 135 you would be in good shape!